Happy Halloween! I remember that as a freshmen in high school, I watched Ghost Hunt the day before and the day of Halloween. Some of those arcs were especially gruesome and terrifying and of course, when it’s close to Halloween, it does indeed get kind of spooky. Ghost Hunt Ghost Hunt was kind of different. It wasn’t a mainstream series. It’s kind of like a well written Occult Academy – in the sense it deals with paranormal and often impossible things. It’s story is based in arcs, where each arc is a case the team has to solve before some horrific happens to either someone they’re solving the case for or one of the team members themselves. It was a fun series, moments of humor, there was some romance and of course what everyone wants, some horror. Looking back now, the animation might come off slightly dated but after five years, isn’t that to be expected? Just a few months ago, during summer vacation, I took a few hours to re-watch my favorite arcs and I was satisfied. The average ANN rating is Very Good so I’d say it’s worth your time too. You can grab the DVDs in English from the Funimation website. Or simply stream the episodes with subs, presumably, from ANN. The first episode starts out with three girls telling ghost stories after school in a dark science lab. What happens after that is anyone’s guess, unless you watch! I was in elementary school when FLCL aired on Cartoon Network. I remember I used a ‘tape recorder’ to record each episode. 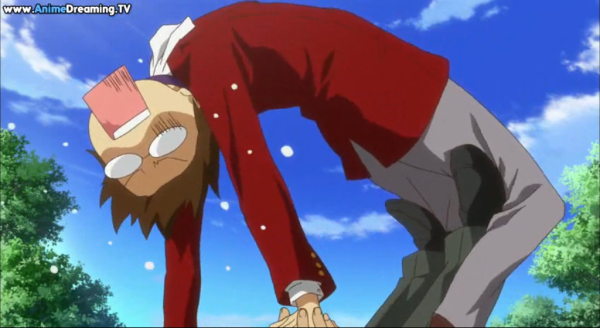 I was in sixth grade just as Naota was in FLCL. Obviously this show wasn’t designed for children in mind, but at the time, it was exactly what I wanted. Seriously, all of these high level topics mixed in with humor that a sixth grader to appreciate. That’s pretty neat. Looking back on old high quality anime like that, ten years ago now, is interesting. back then, I thought it was visually stunning but now it’s just a blur of it’s former beauty. Maybe what I really want is more Railgun and less Index. Yeah, that’s actually what I want. After all the time Touma spent with Index, you’d think this kind of situation would hardly phase him. When I wrote this post, there was only one summary. I can think of only one thing: obvious magic is obvious, in that case. I mean, if the lying from the first series, the lies about Index’s memories, weren’t enough to tip everyone off that the Catholic Church is a liar, I’m not sure what else anyone could do to get the point across. 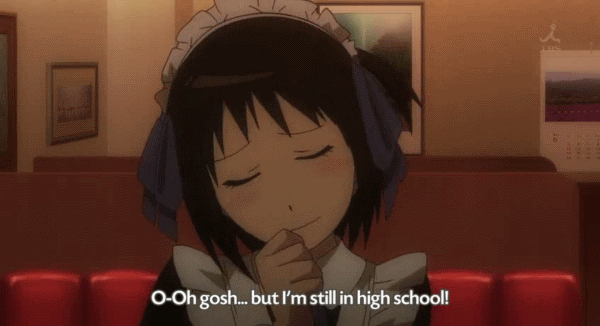 Apparently I have a thing for girls that say, “Oh Gosh…” Being a maid is a minor bonus. I’ll look her name up. Eventually. Hotori. This may be a new posting style. Short like a tweet but long like a post. You might have noticed a huge span of time where I haven’t said a word. You might have noticed that I never covered Index 2 at all. Let me explain my reasons for those things. I’ve been busy. Working seriously bites my time off in chunks. It’s also sad that I really do prefer doing Calculus problems instead of Blogging. Even this post is going to be short because, really, I don’t care right now now. I’m actually still watching episodes. Of what? I absolutely love Squid Girl. It’s way better than Index 2. That brings me to my second point; Index 2 sucked. 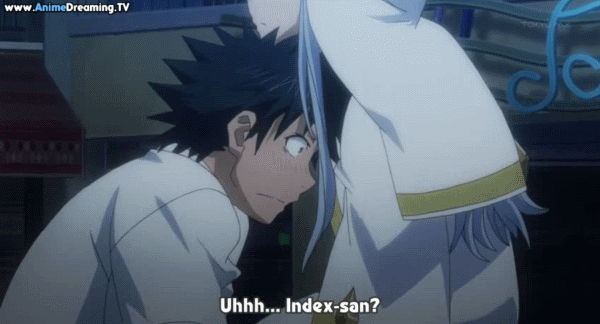 I took the screen-caps of Index 2’s first episode two weeks ago or so and I was applauded at just how bad it was. I saw Railgun, then Index 1 and now Index 2 cannot measure up. At all. Surely it gets better like wine as I progress down the line of episodes, but that’s what marathoning is for. I’m also watching this season’s new maid-show, you know, with the clumsy and no very maid-like girl? I can’t remember the name right now and refuse to look it up. It’s pretty good. I haven’t actaully seen Maid-show or Squid Girl in a while. I’ve been watching the first season of Letter Bee. Why? It reminds me of D.Gray Man. The hero of the story is young and unaware of his hidden powers, his true meaning. The world is similar, industrial punk, in a way. It seems more cheerful in a way, not as mature as D.Gray Man was, but nonetheless, pretty excellent. Allen Walker and Lag Seeing are very similar. Lag is a poor name choice though. As soon as I’m done marathoning all the way through Letter Bee and then through whatever has come out of Letter Bee Reverse so far, I’ll return to the regular posting schedule. 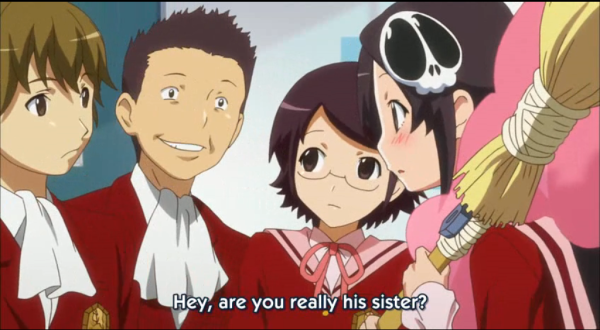 We start right back at where we left off on episode 1, Elci introduces herself as Keima’s younger sister. 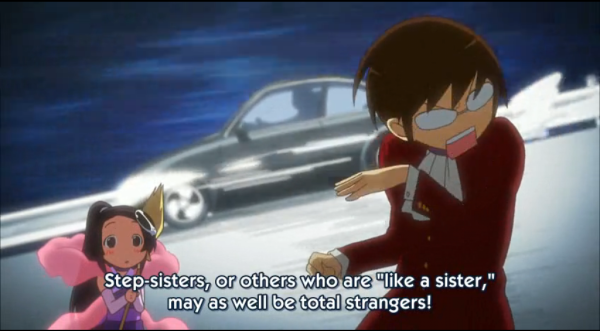 The majority of this episode was based on Elci trying to get Keima to accept her as his younger sister. The left over time was used to introduce a new girl with a loose soul inside of her. how about yourself, Are you really a high school student? It seems Elci will be making the real complicated for Keima. 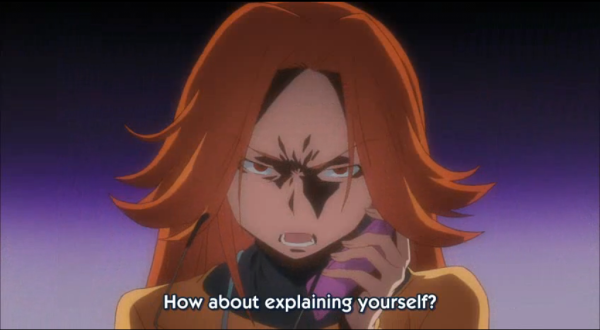 Elci is bombarded with questions as soon as she claims herself to be Keima’s younger sister. Without thinking she says something embarrassing, she claims that all of the girls in the world will be chasing after him. 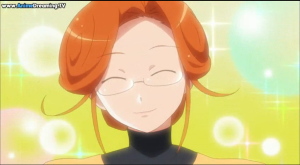 We are introduced to Keima’s mother, she seems to be very energetic and active, unlike a certain someone. Well, this is odd, what happened to the angelic smile? First impressions are usually always deceiving, I guess. This is one of the twists we don’t usually see in mother characters. In the end they never actually said what her name was so we’ll just name her, Keimama. Also from this we can tell that she will be a supporting character, such as adding in comedy and such to the anime. I guess that’s natural since it would be awkward if the mom ever has a loose soul in her. Keima’s standards for sisters are pretty extremely high, Elci’s going to have a tough time trying to make him accept her. 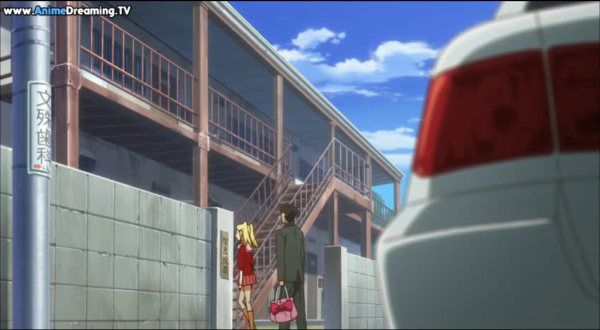 Although this act also causes Keima to have a hard time too. 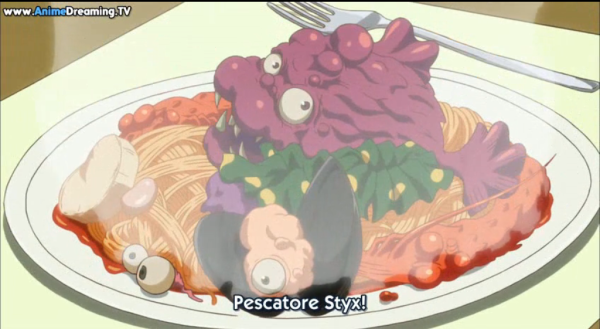 Keima has to eat a ridiculously horrible looking dish, and as usual the dish is actually pretty good. Or so you’d think, the after effects of the dish was a devastating trip to the bathroom. With this done, Elci has managed to clear 2 of Keima’s requirements. In the end, Keima accepts Elci as his younger sister but only because he claims that it would be easier to just accept her than to deny her. 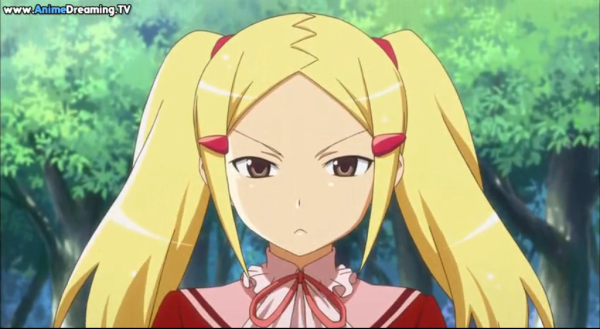 Here is the new girl with a loose soul, Aoyama Mio, apparently to Keima she is an easy catch. He tries to get her to come out of her “iron maiden shell” by confessing and pays for it. oh, i know, its a fountain. It seems Keima’s calculations was incorrect, he must of had missed something about her that makes her different from the other 300 girls he’s seen in his games. That something, is found out at the end of the anime. Maybe this was the reason why she has a loose soul? At school shes thought to be a super rich girl but she’s actually not rich. There are many things to ask but none will be answered until Keima makes a move in the next episode to find out why she has a loose soul. It seems that Keima’s not going to be solving each girls problems in only 1 episode, and every episode wont be about Keima making a girl fall in love with him. 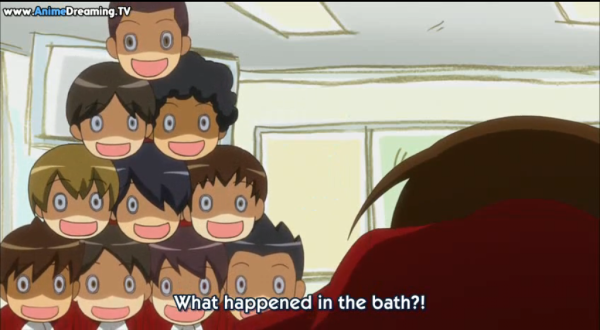 So if you thought that this anime was all about just making girls fall in love and no story at all, you are mistaken.